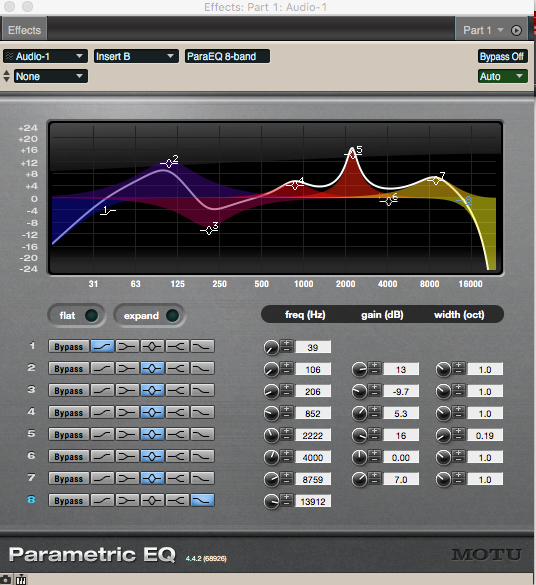 IF YOU USE EQ, USE IT SPARINGLY, AND MAKE SURE YOU CAN HEAR THE RESULTS OVER REAL MONITORS. 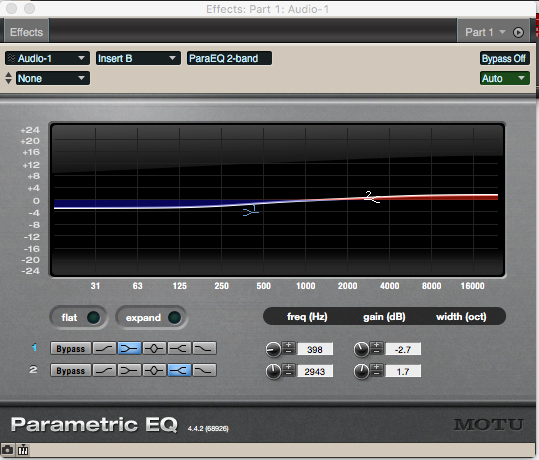 EQ, or equalization, is a powerful tool both for fixing audio and for obtaining special effects. But it's a spice, and like all spices, a little goes a long way. If you're recording on your computer, chances are you bought a nice but inexpensive mic to record with, maybe a condensor mic. Trust me - that mic sounds good. You actually need to pay a lot of money for a microphone that doesn't sound good nowadays (The Copperfone and the Shure Green Bullet come to mind). But all mics sound good nowadays. The differences are in the nuances, which means that unless they're really listening closely, the average person can't hear the difference between a Samson and a Neumann. Band 1 is a slight low-end cut. When you sing close into a mic, it boosts the bass and makes you sound close up. If you're singing with a rock band, you shouldn't sound close up, so I usually cut it a bit. Band 2 is a slight high-end boost. It gives the vocal a tiny bit more air and sizzle, which can make the lyrics more comprehensible in a busy song. And if it's a solo recording? I probably won't EQ it at all. I don't work for a music equipment retailer, nor do I work for any manufacturer. But I need to say this: if you're recording at home, you need a set of real studio monitors. They need to be placed with the tweeters at ear level, and the two speakers and your head need to form an equilateral triangle when looking down on the whole room. That's the only way you can make decisions about levels and EQ. If this is not the case, you should just leave the EQ alone and mix everything flat - you'll be causing less damage. But you really do need studio monitors. Regular speakers, even very expensive audiophile speakers, are designed to make everything sound great over a wide horizontal line-of-sight. On the other hand, studio monitors are made to make everything sound naked and awful and to project the sound into the third corner of that equilateral triangle, i.e. your ears. If I'm off by a foot in my studio (which happens when I lean in to type), everything is smeared and vague-sounding. As soon as I back up and hit that sweet spot again, I can hear the soundstage click right back into place. This is what you need to make any decisions about your music. Not artistically, of course, but from a technical point of view. You need to be able to hear when something's wrong, like the seams between little bits of audio that make digital "clicks" when you're assembling a final take of a vocal, or when you can hear a dog barking in the background during an otherwise silent part of a track recorded with a microphone. Trust me, if people are going to hear your music, someone is going to have a good enough playback system in a quiet enough environment that they'll hear those noises. Any studio monitors will do, but be aware that you'll need to hear what's going on in the low end of your mix. I wouldn't feel comfortable mixing on anything smaller than an 8 inch woofer, though that shouldn't discourage you from trying a 5 inch model, which is still better than regular speakers. If your montiors only go down to 120 Hz, you may have a kick drum or a bass synth that is absolutely overpowering the mix, but you can't hear it. It'll be taking up a lot of the energy in the sound wave for no reason - your song will sound quieter than others. And the low end will be way too loud when someone hears it on a good system. Side note: If you're going to go out and get monitors, get powered monitors. Your mixer connects directly to them with no amp, and they give you good bang for the buck. Mea Culpa: I learned all of this the hard way. I over-EQ'd for years to make up for the stereo speakers I was listening on. The first time I heard my music over studio monitors - and they were cheap monitors - I was embarrassed. Since then, things have improved immensely. THE TAKEAWAY: IF YOU USE EQ, USE IT SPARINGLY, AND MAKE SURE YOU CAN HEAR THE RESULTS OVER REAL MONITORS.